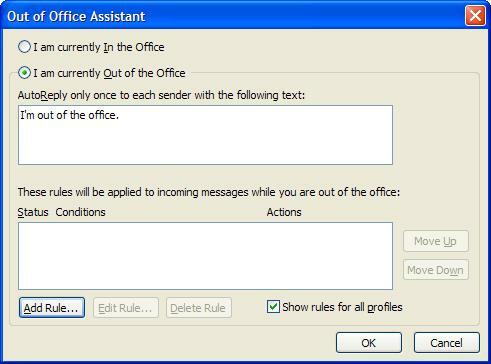 I have not used Out-of-Office via MS Outlook in a couple of years. After a 16 hour flight to Hong Kong from JFK where I caught maybe 4 hours of sleep I am wired and working late on a Friday afternoon. It’s interesting to think of everyone back in the U.S. sleeping the early Friday morning away. I landed at 2PM Friday and the day here is almost over as we approach 6PM and the night beckons. But I’ve already caught up on emails, had a Skype call with China and am happy that the dreaded pile up of work that used to happen when being out of the office is a thing of the past. The only real frustration I’ve had so far (ok the two crying babies on the flight count too) is that my 3G connection here in Hong Kong is not working the way I had hoped – no thanks to Verizon and my Motorola phone. I was informed before I left that this same problem I had last time had been rectified. Alas that’s not the case. The smartphone works fine when I can connect to a Wi-fi network but moving around does not make that easy. Yes I know this should be the biggest problem I have but if you were here you’d be as unhappy about this as am I. Tomorrow I will head to Mong Kok on the Kowloon side and finally get either a China phone or a SIM card for HK and China (I might need two – one for HK and one for China). If I sound as if I am a slave to technology I’d like to deny it but all indications point otherwise. Google Maps is a great tool – but of course you need an internet connection. I have Skype up on my phone all the time for calls and connections both here in Asia as well as back to the U.S.A. Right now I am hard-wired into a connection in an office in Wan Chai and it’s as if I am at my desk in New York or Connecticut. I remember fifteen years ago that being out of the office meant not replying to phone calls right away, (unless they were of an urgent nature), not going through the postal mail (these days like most people I don’t receive much in the way of important business correspondence via the USPS), and not being aware of what was going on in and around the office aside from checking in by phone during the day. Today I am reachable nearly all the time (present situation accepted) and the best part is that when I return to the U.S. I will not have the 100 voice mails, 500 emails to respond to since I’ve already been there and done that! Many people are nearly incredulous about what one does on a 16 hour flight. I guess I’ve done enough of them to have a pretty good working protocol. I read for about a third of the time, watch movies for about a third of the time and sleep for about a third of the time. Aside from my back being a bit tight (once again I was in an extra legroom seat in coach), I am surprisingly refreshed, caught up as much as I can be as I head into my Friday night in one of my favorite cities. The rest of you in the U.S. have yet to experience your Friday. Have fun with that. Like my friend said this evening – my ‘office’ is now wherever I have an internet connection. I’m okay with that – are you? This entry was posted in Best business practices, Communication, Innovation, International business, Living in the World Today, Technology, Travel and tagged Being out of the office, Communication out of the office, Mobile offices, MS Outlook, Staying in touch out of the office, Traveling for business. Bookmark the permalink.